The gift guides are here, the gift guides are here!! How great would it be to feel confident your kids are not only going to love their Christmas gifts, they’ll keep returning to play with them again and again? These are the toys that are actually worth your hard-earned money. These are the Toy Awards that parents in-the-know have already viewed over 7,000,000 Times! Pin it to your favorite gift or toy board or bookmark it (and share it with your mom friends – they’ll thank you!). All signed up? Good! Now, on to the toys. There are 15 toy gift guides in total, some arranged by age and others by interest (STEM, outdoor play, etc.) but today I’m releasing my annual list of the the best toys of the year. Because I’m all about high-quality, engaging toys not everything on this list is brand new. This is not your run of the mill gift guide. I work on these babies all year long, every year, researching, cultivating, and fine-tuning the gift guides until they’re just right. There are so many STEM toys on the market now that they can all kind of blend together. This Harry Potter Coding Kit from Kano, though, is a definite stand-out. I love how it uses the magic of Harry Potter and the step-by-step building of a physical wand to encourage kids to learn coding. This super innovative kit allows kids to build a wand that responds to their movements and then learn to code with 70+ step-by-step creative challenges. They can make feathers fly, goblets multiply, fire flow, pumpkins grow, and more. My daughter is a huge HP fan and I could see her absolutely eating this toy up. And, of course, any toy that sneakily teaches coding skills while the kids are having fun is a big, big plus for me. The tagline for this unique set says it all; Build a Wand. Learn to Code. Make Magic. This is AMAZING for rainy day play. 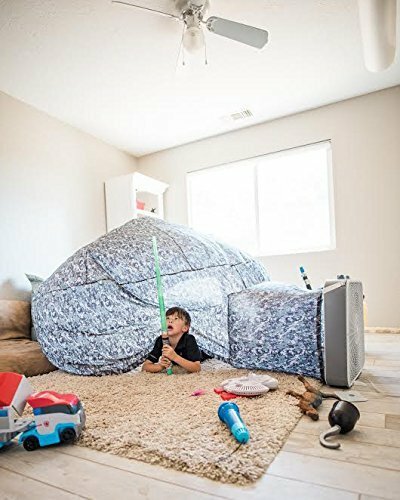 Such an easy way for kids to set up a fort- set up (and clean up!) is so simple… like 30 seconds easy. Check out this video to see it in action. My friend got one of these for her kids last year and she reports that they spend hours inside playing together and on their own. This one is going under our tree this year for sure! This inexpensive magical wand uses 90 silly commands (sway, creep, stomp like a dinosaur, leap) and 26 songs, along with a light show to get kids moving. This is one of those rare toys that’s great for siblings of different ages to play with together (my kids have loved it at various ages ranging from 18-months-old to 7-years old). Note: If animals aren’t your kids’ thing, there’s now also this gym version. A gloriously smart combo of Connect 4 and the ultra popular Bounce-Off… this game of strategy and luck is equal parts exciting and goofy fun. Talk about the perfect rainy day activity and just the thing to pull out for family game night. This one’s ideal for a range of ages and interests, it’s sure to be at the top of lots of kids’ Christmas lists this year and will lead to hours of good ol’ fashion family fun. Kids LOVE making forts and, I gotta say, I‘m a big fan of anything that will buy me a solid hour or two of busy time. What I’m not the biggest fan of? The beating my couch cushions take when my kids get into fort-building mode. That’s reason enough alone to love the Fortboard kits but there are quite a few other reasons too. First is all the super cool kinds of forts you can build. After Fortboard sent us two boxes to review, my kids started with the instructions for making a house on their website company’s website. Next up was the submarine. After a little trial and error, they pretty quickly got the hang of it and, let me tell you, they were pleased as punch about their new fort– which they insisted stay up for a week. That was fine by me as it resulted in TONS of cooperative dramatic play. Next up was the submarine and the castle, both of which were equally successful. By then, even my 3-year-old was able to build stuff with these on his own. His current favorite is to make cubes, which he calls “bombs” and use them to knock down stacks of even more cubes Angry Birds style. Fast forward a few months and they’re now building their own master creations like that 6-wheeler semi-truck pictured up top. It’s become a thrilling game to challenge each other to see what they can build next. The second thing to really love is the ingenious ways these boards can connect in different ways to create all sorts of angles, and even curves. The secret is the connector arm that can be moved to join the boards in different ways (and teach your kids about angles in the process). It’s so innovative, in fact, that it’s won multiple awards and even a Microsoft Small Business Contest. The final thing I love about Fortboards is how compact they are when it’s time to put them away. Unlike with their competitors’ sets, there are no awkward polls to store (and no polls for kids to hit their siblings with). Everything tucks into a box and neatly stores under a bed or in a closet when playtime is done. Like other fort sets, this one is spendy but if your kid is a builder it’s worth the investment, especially if you’re looking for something great for play dates or for siblings to play with together. This is #1 on my list for my daughter this Christmas, and if you’ve got a kid who loved Fingerlings last Christmas, this one should be a slam dunk for you too. In fact I got mine on pre-order because like it’s predecessor, I can see this being one that is hard to find come December. What’s so great about the HUGS, is that they take the cool interactivity of the original Fingerlings (burps, toots, laughs and more) and makes them soft and cuddly! LEGO tape is one of the coolest things to happen to LEGO in a long time. This bendy, adhesive stuff allows kids to expand their LEGO universes onto the walls and ceilings and opens up endless possibilities for play. The tape is re-positionable, washable, extremely flexible and easy for little fingers to cut and arrange. I love this particular pack because it comes with 4 rolls in different colors. Perfect for a present for one child or break it up and put a roll in each kid’s stocking. And I really appreciate that the rolls are eco-friendly and made from CE and FDA certified Food-Grade silicone. I just gifted a roll to my son for his 9th birthday and he has had so much fun coming up with new ways to use it. This one gets two big thumbs up from our family. This deceptively simple toy is so much more than it appears. Parents and teachers rave about the hours and hours their kids spend shooting things through this heavy duty tunnel. When my friend first introduced me to the Tot Tube, I really liked the idea but wondered if it was worth the money- couldn’t we essentially do the same thing with a cardboard wrapping paper tube?). Read the reviews on this one and I think you’ll be sold. Along with Chow Crown and Flick’ Chicken, Don’t Step In It is one of my top picks this year for games guaranteed to supply family fun for all ages. No matter how distasteful we may find it as adults, poop-themed toys and games are huge right now. The good news in this game is you can spend your turn wearing a blindfold and not looking at the fake poo! Basically, players take turns blindly traversing the game mat barefoot and trying not to step on the soft and squishy poop. Like I said, hilarious fun for kids of all ages… and don’t forget to check out the Unicorn poop version too! This is the rare toy that truly is like no other I’ve ever seen. Imagine if three of the all-time most loved toys in history- Hot Wheels, Pokeman Cards and Transformers- had a baby… you’d have Mecards. You really have to watch the video to understand the magic of how this works… but basically kids “battle” by each rolling their cars over a facedown card. What happens next is some crazy cool “magic”. The car not only turns itself into an action figure, it also picks up and displays the magnetic card to show who has won the battle. Both my son and daughter have gone through big Pokeman card stages, mostly so they could battle, and I just know that my son is gonna flip out when he sees this. In fact, every year when I start working on these guides I vow that I will not buy anything for the kids yet… Nevertheless, 4 of these Mecard sets are on the way to our house as we speak. Each vehicle comes with 3 cards and I’m thinking a good starter pack for would be 4 vehicles (which will come with 12 cards). To see the true magic of these cards, you have to check out the video above- you will be sold! The last thing I really like about this set is that the cards make it really easy to tailor the game to the age of the player– you can keep it super simple for preschool and kindergartners and much more complex for elementary aged kids. This was the total sleeper hit of Christmas for my preschool-aged son last year! I’ll be honest, when my son went crazy for this thing in the store, I thought it was kinda a plastic piece of junk but NO! Endless dramatic play options keep him and his friends (and even older siblings) busy for so long. The scoop’s magnetic & the cash register reads the recipe cards and gives step by step instructions. There are even lots of voice prompts, including counting, and a coin slot… I’m telling you, this gets pulled out EVERY. SINGLE. PLAYDATE. You heard it here first, the Pomsie is the Fingerling of Christmas 2018. So if you’ve got a kiddo that was a fan last year, get ready to start hearing some requests for these cuddly weirdos. Just like Fingerlings, the Pomsies express emotions, but in an even more elaborate manor. Not only do they make over 50 different sounds, they also react to touch and have eyes that can light up to convey how they feel. Last but not least, they’re soft and pliable so that kids can wrap them around their hand, backpack, bedpost, or whatever they want. Generally all things Hatchimal, Fingerling and the like are NOT my favorite but I can’t deny that they are basically catnip to girls under age 10. And I can give major points to this one for being small and not one that will add a lot of clutter to the house! I’m always on the hunt for a great game for family game night, or our Christmas Eve tradition of playing a crazy game with the family. The key components I’m on the hunt for are that the game is easy to learn, highly entertaining and suitable for kids (and adults!) of all ages. This one totally checks all the boxes. Essentially frisbee golf with rubber chickens, players toss the target to get started, then take turns flicking’ their chicken at the target. Sounds easy enough, but these funky chickens bounce and roll, so hitting the target will test your chicken flicking’ skills! My hope is that this might even be something my older elementary grade son will enjoy doing with his friends at playdates- you know, instead of ALWAYS defaulting to Xbox. This clever kit is the all-time-best-seller on our gift guides and another multi-award-winner that takes advantage of kids’ natural interest in building toys (like LEGOs) to teach the principles of electricity. The components aren’t intimidating, snap together simply, and can be used to create a bunch of cool projects. The standard set comes with 60+ pieces to create over 300 different electronic projects. The pieces include snap wires, slide switches, an alarm circuit, a music integrated circuit, and a speaker and are numbered and color-coded to make identifying them easy. Snap Circuits Lights – This colorful lights edition puts on quite a show and is another favorite around our house.Just connect any MP3 player and be amazed as your music creates a mesmerizing light display.No two songs will ever produce the same light show. Includes prepunched patterns for motor, strobe light, and color-changing LED, lighted and glow-in-the-dark fans, strobe integrated circuit, color organ controlled by MP3 player, voice, or finger. Builds over 175 experiments. Snap Circuits 3D Illumination – Allows kids to go beyond the flat surface to build circuits horizontally, vertically and even upside down. The 3D setup means you can actually build a house and there’s even a projector that projects things onto the wall. Snap Circuits Arcade – Lets kids actually build – and play! – mini arcade games. There’s also an incredibly cool fan that can be programmed to project any word or phrase onto it with lights. For bigger kids, you’ll definitely want to check out the reduced priced Snap Circuits Student Electronics Training Program down this year from $199.99 to $161.71 as well as the Alternative Green Energy Kit. This is a great way to change up story time at night and encourage math skills in kids that are excited about the subject as well as those who need some help getting excited. Psst – We’re now on the second and third books in the series. When my kindergartner came home from school one day asking me to teach him to play chess, I had mixed feelings. On the one hand, I was excited because, despite spending a lot of our time together on sports-related activities, I have great memories of playing chess with my dad growing up. On the other hand, I was afraid he was a little young for it and might get frustrated and give up on the game altogether. Enter “No Stress Chess”. This is the first board game ever made specifically with young toddlers in mind. Toss the big plush cube and identify which colored side faces up. Choose a matching color card and perform the simple activity shown, such as “Make a happy face”, “Moo like a cow” or “Find something blue”. Designed for parent and child to play together, Roll & Play strengthens bonds and builds confidence while encouraging creativity, active play and gross motor skills. This seems like a good solution if you’re looking for a family game night selection that can incorporate even your youngest kiddos. Moms figured out long ago that letting kids sort things in a muffin tin is a great quiet time activity. This play set expands on that idea by adding in multicolored mini muffins, dice, and cards that can be placed inside the muffin tin for sorting and math purposes. There are also some interestingly shaped tweezers for fine motor work. All in all this one has A LOT of play-ability. A few years ago tutorials for making your own electric play dough were popping up all over Pinterest. I would excitedly click on them with the intention of whipping up a batch for my kiddos, quickly get defeated by ingredients I didn’t know how to get, and give up. This kit is the answer to my prayers. I’m so excited about the possibilities for teaching the kids about circuits in such a fun new way! It’s got so much that kids love, i.e. play dough and and things that light up, and the vibrant instruction booklet includes step-by-step instructions for 15 clay circuit building projects. This one is a multi-award winner and sure to be a big crowd pleaser! Performing some basic science experiments at home is a great way to inject a little learning into your quality time with the kids. This set gets great reviews from parents and comes with step-by-step instructions for each experiment. There’s also a detailed science guide that provides adults with “mind blowing science secrets” that help to answer questions about what’s happening in each experiment. The first thing I thought when I saw this book was that it was a combo of two of my son’s favorite things: LEGOs and the game Mouse Trap. From the manufacturer, “LEGO Chain Reactions is packed full of ideas, instructions, and inspiration for 10 LEGO machines that spin, swing, pivot, roll, lift, and drop. The kit comes with 78 page book, 33 LEGO elements, 6 LEGO balls, 6 feet of string, 8 paper ramps, 2 paper pop-up signs, 1 paper funnel ramp, 1 paper flag, 1 paper bucket, 1 platform and the makers assure that you don’t need to worry that you won’t have the right bricks as they made sure you’ll need only the most common bricks, and that there are plenty of substitutes. And while we’re on the topic of LEGO build books, The LEGO Ideas Book and LEGO Play Book are also well worth looking into. I’ve been talking about the social and emotional learning benefits of dolls for boys for years in our Best Dolls for Girls and Boys Gift Guide, so I was super pumped about the release of this line of dolls designed specifically to meet those needs while staying in-tuned with boy culture. Created by a therapist and mom, after her son came home from preschool one day and announced that ‘boys aren’t supposed to cry’. Frustrated by many of the messages boys were (and weren’t) receiving and inspired by the way play influences child development, Wider created Wonder Crew to promote social and emotional learning, build confidence and imagination, and empower boys to see themselves as caring, creative and strong people. I’m totally on board and will definitely be getting both the superhero doll and the extra construction outfit for my son! I also love how each set comes with props for the child to wear too, so fun! Our 1 1/2-year-old is started to getting in on the fun sorting and manipulating the pieces with his hands and was off and drilling around the time he turned 2. Now this is one of the first toys he goes to, again and again, when given a choice. The popularity of this toy has also led to some cool variations, including the Design & Drill Flower Power Station, the Design & Drill Power Play Race Car and, my favorite, the Design & Drill BrightWorks– which is like if the Design & Drill had a baby with the classic Lite Brite from my childhood (in other words, the pieces light up and it’s totally awesome). One of the best-sellers ever amongst all 350 toys on our gift guides. My son got this strategic domino and scrabble-like game for his 5th birthday and, since then, has asked to play it during our one-on-one time over and over. Although we altered the rules and points system a bit to adjust for his age, this Parents’ Choice Gold Award and Mensa National Competition winner is still fantastic for working on shape and color recognition as well as pattern perception and spatial and critical thinking skills. Not long after we brought the game home, my 4-year-old daughter got in on the fun too. I can tell this is one that our family is sure to be playing for years to come. I’ve wanted to add a stop-motion kit to the gift guides for a while now but just couldn’t find one I was totally sold on. I think it’s such a great way to get kids creating and using technology in a much deeper way than they typically do. Plus, there’s a lot to love about this simple Stikbot kit! First, of course, is the price. This could easily become one of our go-to birthday party gifts and could also work as with a Christmas gift or a stocking stuffer (would also be a really fun White Elephant Christmas Party present). Second, you can tell the creators of the kit have really thought hard about what will get kids excited about stop motion as well as what might frustrate them. The figures come with suction cups on the hands and feet so that kids can more easily make the small position changes necessary to get a good stop-motion video. 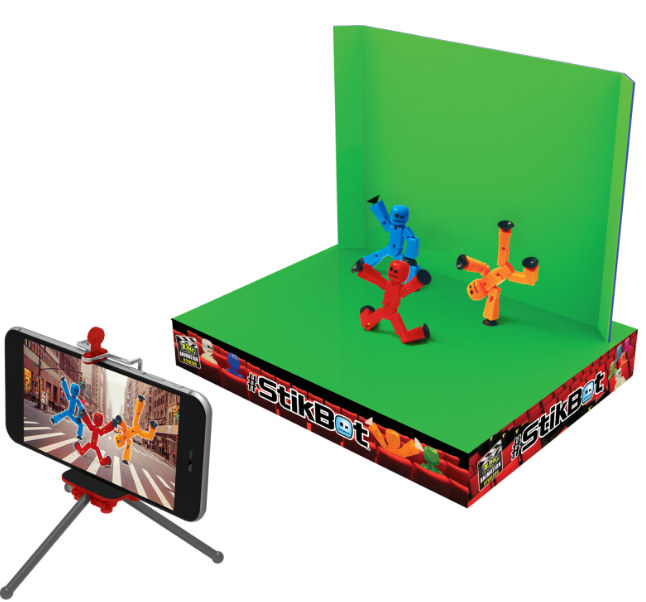 And the free stop-motion app that’s included has a couple of really cool features like multiple green screen backgrounds and sound effects. Finally, I like that it’s set up to be used with a smart phone and even comes with a tripod for doing so. And, if your kid really gets into it, there are lots of add-on animals, accessories and other figures you can add in (at a price perfect for kids saving up their own allowance money to buy). This one is going on the Christmas list for my 9-year-old for sure! Psst – if you have a Minecraft fan in the house, definitely also check out this Minecraft Stop Motion Animation Studio. Another hot item in the tech toys genre this year is the newest Fur Real Friend- that’s right, it’s Chewie and, according to the internet, he just might be the cutest thing ever. If you’re not familiar, FurReal Friends are animatronic animals that have been best-sellers with kids the world over for the last few years. Previous hits include the less expensive Blazin’ Dragon (who actually breathes “fire”) and My Walking Pup Pet (always SUPER popular with girls in particular). Chewie features 100+ sound-and-motion combinations, responds in the Wookiee language, laughs and, to get his point across, he’ll often raise his arms as he roars. But this fuzzy pal’s got a tender side, too, making contented sounds when he gets a friendly scratch on the head. And at the end of a long day saving the galaxy? Yeah, he snores! Seriously, this guys look more like he belongs in a fancy Disney ride then on your local toy shelf! So those are my top picks for the best toys out there, but there will be a lot more to come in the next couple of months leading up as I finish up the 2018 MPMK Toy Gift Guides so stay tuned!